How to sync Outlook folders with iCloud folders for free? Perhaps you have already delved into the Internet in search of a synchronization tool that could save you time and effort of keeping your iCloud data up-to-date in Outlook. Here comes the good news, you can breathe a sigh of relief as you have just found the right application. CodeTwo Sync for iCloud will help you automatically synchronize your Microsoft Outlook calendars, contacts and tasks with the corresponding iCloud folders. Keep reading to find out how to get iCloud and Outlook synchronized. Watch the video to see how CodeTwo Sync for iCloud works in a real environment. Before you start configuring the program, you need to make sure that iCloud for Windows is running on your PC and iCloud is set up on all your Apple devices you want to keep synchronized. 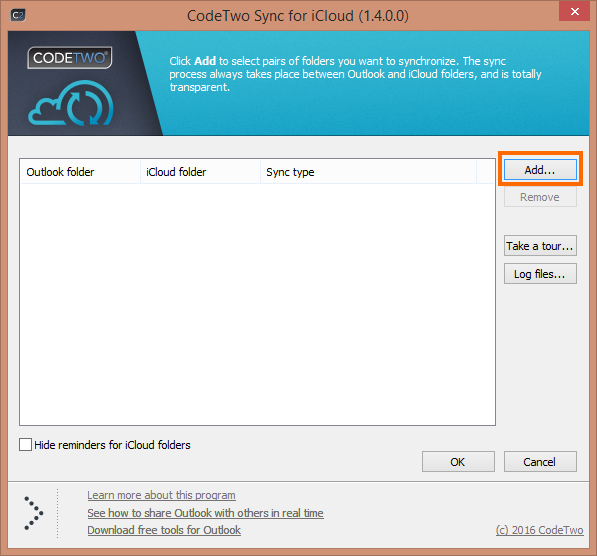 Download CodeTwo Sync for iCloud for free and install it on the PC with Microsoft Outlook. Make sure that Outlook application is closed during the installation process! Once the program has been installed, open Outlook to see whether the CodeTwo Sync for iCloud icon is visible in the Outlook top menu. 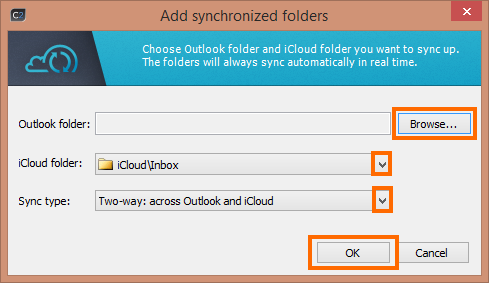 To set up synchronization folder pairs between Outlook and iCloud, double click the program’s Settings icon. In the resulting window, click the Add button to select folders that you want to synchronize. Now, choose the Outlook and iCloud folder pairs, then select the synchronization type, and click OK.
Repeat steps 5 and 6 to add other folders to the list. The synchronization process works automatically and it is performed in real time. Go to selected folders to view or modify freely all items – all changes will be synchronized to the corresponding folders in accordance with the chosen synchronization type. And that’s it! From now on, your Outlook and iCloud contacts, calendars and task will be kept up to date. Note: As the program is available at no cost, there is no technical support offered for this tool. To address possible issues, you can refer to FAQ or this knowledge base article. The application can be downloaded for free from this website. I am just wondering if you read my comment above, and if you have anything else for me to try? As a matter of exception, as we do not offer support for our free tools, our Customer Service technician will contact you via email. A one-way sync from my Outlook Calendar to my new (starts out blank) iCloud Calendar results in continuously creating new events – if I don’t stop it there can be many copies of the same event on a single day. It doesn’t happen to all events – just to some. Maybe only to events I’ve created since moving to 2016? I’m not sure. Thanks so much for your help. I was actually running the latest version of iCloud as well as version 1.4 of the control panel. But just in case, I completely uninstalled iCloud and removed the codetwo add-in from Outlook 2016. Then I reinstalled the latest iCloud panel and configured it for use with Outlook calenders, etc. Then I re-installed the codetwo software using your link above. Now my problem is that even though the installation seemed to work, Outlook is not showing the CodeTwo panel. Nor does it appear in the list of Add-Ons. It is not even showing there as disabled – it does not appear at all. I made sure I had quit outlook before installing the CodeTwo software, and even rebooted before installing the CodeTwo software to make sure. I don’t see any uninstall for CodeTwo. 1. Open your Outlook 2016. 2. In Outlook, go to File>Options. 3. In the Options window, go to the Add-Ins section and click the Go… button. Make sure that in the Manage field you selected the COM Add-ins option. 4. In the resulting window, click Add and select the C2SyncForiCloud.dll file. I also bought the program several years ago, but I’ve recently started having a strange problem. I am syncing between a calendar on Outlook 2016 and a new iCloud Calendar using a one-way sync from Outlook->iCloud. Everything works EXCEPT some calendar events that were created automatically via meeting requests keep getting duplicated over and over. Keep in mind that this is a one-way sync so the iCloud Calendar gets filled up with copies of these events. Because of this, I can’t use the product at all! Is there any way you can suggest something for me to try? Note that all other calendar events are syncing as expected. Please update the program to the newest version (1.4), which you can download here: http://www.codetwo.com/sync-for-icloud/download?sts=5999. The issue with meeting requests synchronization you are describing has been fixed in version 1.3.3: http://www.codetwo.com/sync-for-icloud/history?sts=5999. As for using Outlook 2016, please also make sure that you are using the latest version of iCloud for Windows: https://support.apple.com/en-us/HT204283. I bought the programm about two years ago and I like that everyone now can benefit from your software. But after reinstalling it the configuration icon is not showing in the outlook menu. I read all FAQ and knowledge facts (e.g. deactivatet add-on, trust center, default profile etc.) but nothing helps. Without this icon I can’t configure the sync to icloud. I’m using Outlook 2007. Any idea whats happend here? Please remove your current installation completely as per this KB article: http://www.codetwo.com/kb/uninstall/?sts=5999 (remove all CodeTwo-related folders from your computer). Then, download CodeTwo Sync for iCloud version 1.4 from this website: http://www.codetwo.com/sync-for-icloud/download?sts=5999 and perform a fresh installation (during the installation, Outlook must be closed). Keep in mind that removing all CodeTwo-related files results in removing cached data with information about already synchronized items so duplicates may appear during the first synchronization.